Although she was baptised Caroline Elizabeth, she must have been known as Elizabeth as the 1861 census shows the family of Thomas and Ann and here the youngest of the eight children is Elizabeth aged two. 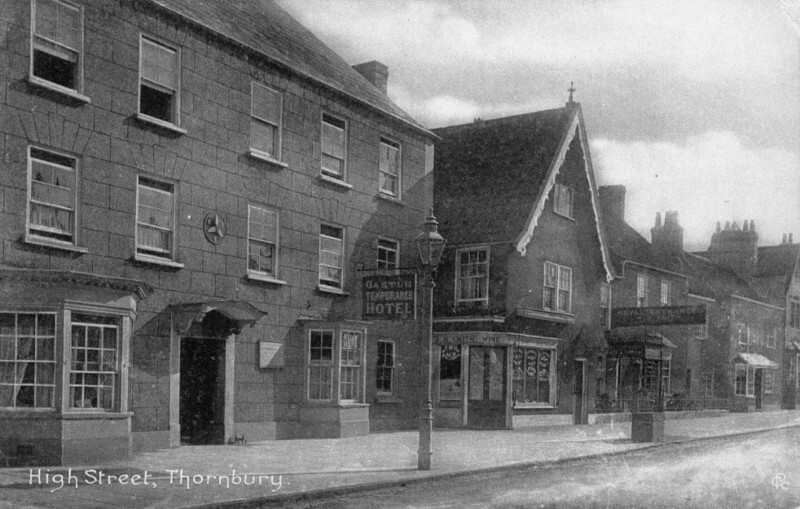 At that time Thomas was publican of an inn which was thought to be at 31 High Street. Caroline’s father died in 1866 and life must have been very difficult for the family. In the 1871 census, aged only 12 Elizabeth Bevan as she was called was working as an under nurse in the very extensive household of the Councell family. William Henry Councell was a grocer in the High Street. He and his wife had nine children, five of whom were four years old or younger. Annie Bevan Caroline’s older sister aged 23 was a nurse there and Elizabeth Bevan was obviously her assistant. By 1881 Caroline Elizabeth then aged 22 and her sister Emma Bevan aged 29 had become servants in Toxteth in Liverpool in the household of Thomas Easton, the master of a sugar refinery. We don’t know what led them to move North. Caroline married Henry Butler a hydraulics engineer in Liverpool on 11th September 1883. We understand that at the time of her marriage Caroline was living at 37 Cambria Street, West Derby in Liverpool. The 1891 census shows that Henry Butler was from Nottinghamshire and was 33 years old. He and Caroline Elizabeth were letting furnished lodgings in Toxteth Park in Liverpool. At that time they had one son Alfred born in Liverpool and aged only one year. Alfred Harry Butler had been born on 8th October 1889 at 99 Hill Street Toxteth Park and baptised on 6th November 1889 at St Matthew’s Church in Toxteth. His parents were said to be Henry and Elizabeth Butler and so it would seem that Caroline continued to use her second name in official documents. Caroline and Henry had another son born 27th January 1893 also while they were at Hill Street in Liverpool. He was called George Archibald Butler. Sadly George’s death was registered in Toxteth Park in the March quarter of 1894 and apparently before his first birthday. 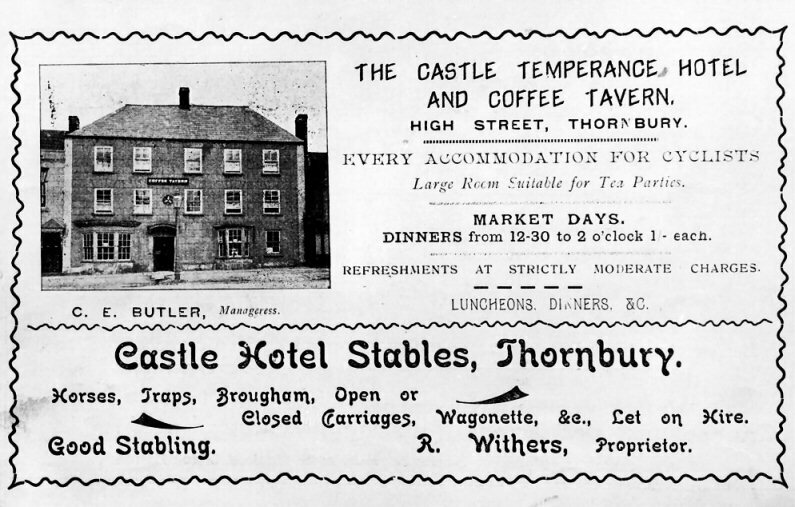 We don’t know exactly when Henry Butler became the manager of the Castle Temperance Hotel (see the hotel on the left) but he gave this as his occupation when their son Howard Arthur Butler was baptised on 16th July 1897. The Temperance movement was important in Thornbury and it was strongly supported by Stafford Howard of Thornbury Castle, hence the name. Read about the Coffee Tavern and Temperance Hotel. Henry Butler died in Thornbury on 10th May 1899 aged only 41. His will appointed his wife Caroline Elizabeth, James Bevan the boot manufacturer and William Harris Ponting a draper to be the trustees and executors. He left an income for his wife for her life time and then the estate was to be divided equally amongst his children. The Bristol Mercury of May 16th 1899 says that Henry Butler the manager of the Castle Temperance Hotel died after a lingering illness and that he was buried in Thornbury Cemetery, after a service at the Wesleyan Church of which Mr Butler was a member and an official. The family mourners were Henry’s son Master Harry Butler, Henry’s brothers in law James Bevan, Alfred Bevan, and Joseph Sainsbury (the husband of Mary Bevan, Caroline’s sister), Fred Sainsbury and “Mr Tremaine” (the husband of Ann Bevan, Caroline’s sister). Caroline and Henry’s baby Reginald Ernest Butler was born on 1st June 1899 after his father’s death. He was baptised on 29th June 1899. It is hard to imagine how Caroline could cope as her baby Reginald Ernest Butler died soon afterwards. He was buried in Thornbury Cemetery on 12th September 1899 aged only 3 months. Despite all this the widowed Caroline Butler took over her husband’s duties at the Temperance Hotel. We also know that by 1899 Mrs Butler owned 34 Castle Street. We believe “Mrs Butler” referred to in the Rate Books to be Caroline Butler, the daughter of the then occupant Ann Bevan. We have seen the request for planning permission submitted by Walter William Pitcher dated 12th May 1899. This shows that Mrs Butler intended to put in a new scullery and a dry closet. The “existing cesspool” is shown but the intention seemed to be to cease to use the cess pool which was just outside the back door of the house and to use the bucket collection instead. The sewer pipes were not put into Castle Street until the mid 1930s. In the 1901 census Caroline aged 42 was living with Robert Withers aged 33, who let traps for hire. Robert Withers was the proprietor of the Castle Hotel Stables. They had Caroline’s two sons living with them; Alfred Harry aged 11 and Howard Arthur Butler aged 3. They had a servant Ellen Vizard aged only 13. The advertisement above on the left must have been produced about this time. You will notice that the manageress of the hotel is C E Butler while slightly greater prominence is given to the stables and its proprietor R Withers. Caroline and Robert Withers had one son, Charles Withers born on 2nd June 1901. His birth certificate records the birth of Charles Withers to Robert and Caroline Elizabeth Withers (late Butler, nee Bevan). Shortly after the birth of Charles, on 3rd September 1901, Caroline had an untimely death at her home in Castle Street, Thornbury, unfortunately drowning in a rainwater barrel. She was buried in Thornbury Cemetery on 5th September 1901. The burial register says she was aged 43 and living in Castle Street. We have been told that Robert Withers died at New Engine, Westerleigh on 5th December 1924. Charles Withers was brought up by his father, Robert Withers. Charles Withers married Winifred Violet Edwards at St. Nicholas Tollentine, Bristol on 21st August 1926. They had four children Kenneth Robert, Catherine Joan, Winifred Mary and Peter Joseph. Click on the thumbnail image on the right to see a larger photograph of Charles Withers born in 1901. Howard Arthur Butler was born in 1897. In 1919 when he was 22 years old he married Catherine Redding in Alexandria in Egypt. They had two children Hubert Arthur Joseph and Gertrude Catherine both born in Egypt. Apparently Howard later emigrated to Australia, where he lived for seven years and worked as an insurance inspector. He died in Dandenong in Victoria on 7th March 1961 aged 62 of cardiac failure. The death was reported by his son Hubert.